The western U.S. is dry, and wildfires are a normal result. Wildfires, a natural occurrence, are made worse by drought and the effects of a changing climate. Seasonal campfire and stove restrictions are regularly imposed in many areas to help curb the risk of wildfire. It is your responsibility to know what the current restrictions are for the area that you plan to visit. The PCT goes through dozens of different National Forests, Parks, and other types of land management units. 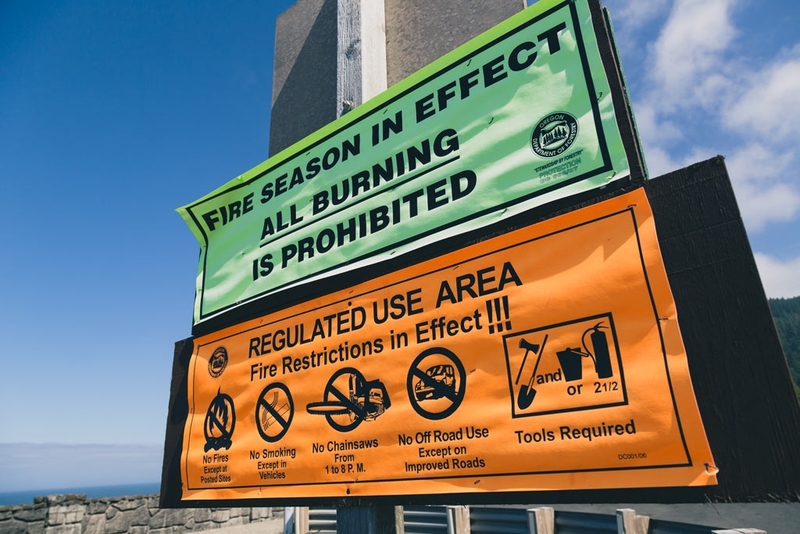 Because fire season varies widely by region, each jurisdiction—whether federal, state, local or private—has the authority to impose seasonal fire restrictions within the area they manage. Campfires, certain types of stoves, smoking and other activities might be banned. Fire restrictions are common in later summer, or earlier during droughts. Because fire season varies widely from year to year and among regions, restrictions can be imposed at any time. Restrictions may be basic, such as prohibiting campfires and smoking, or they may be more comprehensive, prohibiting all open flames, and even camp stoves. It is important to note that in many areas on the PCT campfires are never allowed even with a valid campfire permit. Please read our main fire information page for details. They’re a quick snapshot that tells you how risky the day is. 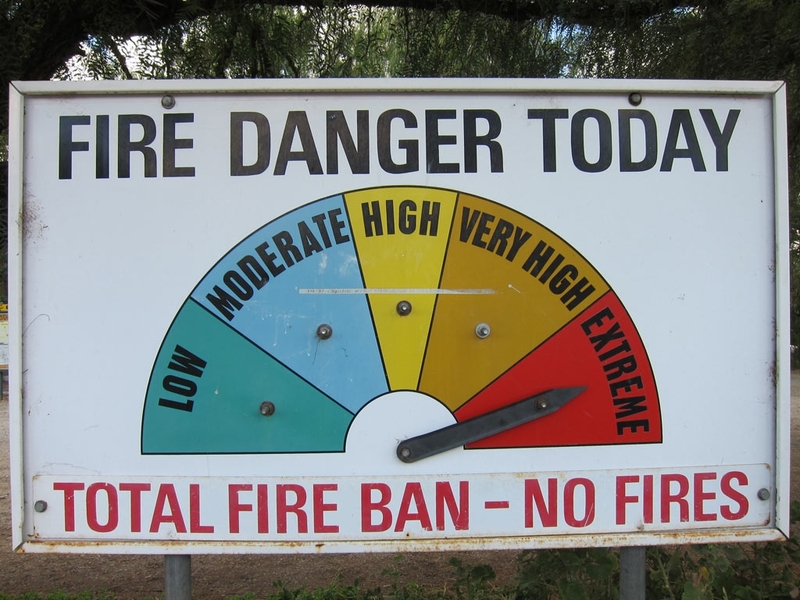 Fire Danger Levels are what you see often on colored roadside signs with a barometer from green, blue, yellow, red and black. Fire danger levels are reviewed almost daily during the dry months. As the danger becomes greater, the increase in danger level might trigger a higher set of restrictions. It’s a “Hey! Watch out!”, the next 24 hours are prime for wildfires. Basically, these warnings are telling you that conditions may be ideal for the ignition and rapid spread of wildfires in the next 24 hours. These are a high-level alert issued by the National Weather Service and you will find them at weather.gov. Everything from wind speed, to how dry the forest is, to how remote a place is might be considered when setting warning level. During red flag warnings, trail crews aren’t even allowed to use chainsaws. Simply running a motor in the woods can be too risky. Check for fire weather warnings before you head out. If you’re already in the backcountry, and it’s been hot, dry, and windy, you can assume that a Red Flag Warning has already been issued. These watches are saying that in the next 12-72 hours conditions favorable for wildfires might develop. A Fire Weather Watch is telling you to watch the forecast. A Red Flag Warning might be issued in the near future. So, what do you do when you learn about a warning or a restriction? You may need to change your behavior. Dry fuels (sticks, grasses, and branches), low humidity, heat, wind and thunderstorm conditions can lead to watches and warnings. During some events, hundreds of wildfires start in a short period. Generally, campfires are banned during these warnings. Your stoves and other fire sources, might also be restricted. Travel and camp with extreme caution. It is your responsibility to know what the current restrictions are for the area that you plan to visit. You can be held liable for the cost of suppression and damages of a wildland fire that you cause. You help protect our wild places by knowing and following the rules for the safe use of fire. Check the land management websites (fs.fed.us, nps.gov and blm.gov) and enter the forest/area you are interested in. If it’s a Forest Service website, look at the box on the right side of the screen for current alerts and warnings, including fire restrictions, burn bans, and area closures. Call or visit the local ranger station nearest your destination. Check the weather forecasts at weather.gov for Red Flag Warnings and Fire Weather Watches. In Oregon, the Oregon Dept of Forestry Restrictions & Closures website is a good resource for non-U.S. Forest Service managed land.